Pierre Hermé was probably the first celebrity I’ve ever met and something I never forget. Having him shyly thank you for enjoying his famed desserts was just surreal. Then, macarons were not as popular as they are now. One could say my virgin taste of a macaron was from the Master’s hands (No, not John Simm’s). Since then, there was no looking back. There are plenty of macarons offered within the island today but good ones are scarce. Having tasted many of the tiny sweets from across the world (thanks to a well-travelled brother), we were able to appreciate how difficult it is to have consistent and almost perfect macarons in one box. 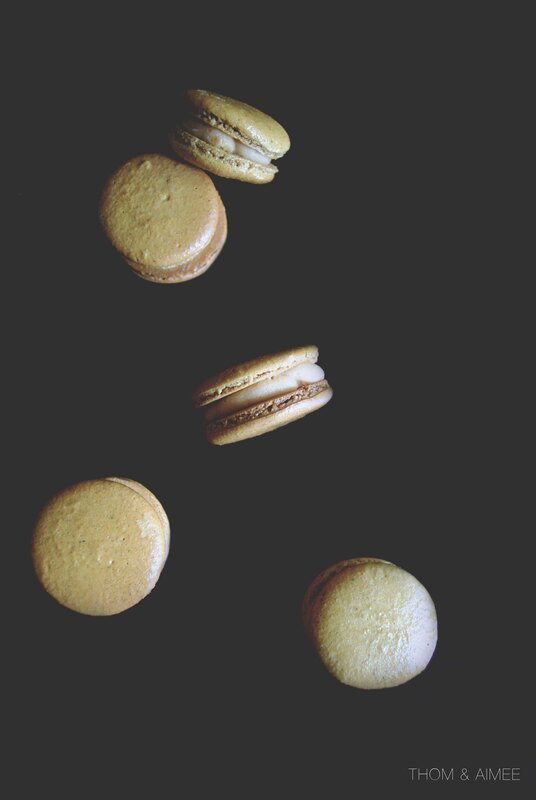 The Salted Cream Caramel and Apples macarons are Pierre Hermé’s recipe. Ours may not be as divine as his, but to make others smile when they bite into it was satisfying enough. The apple takes a seat back and becomes the supporting cast. Caramel is a magical thing – ordinary sugar that transforms into a rich velvety amber syrup when heated. Add salt and you get the best of sweet and savoury. The moment when you bite into this macaron and find a burst of tartness from a piece of apple is pure joy. We still have plenty of leftovers but there won’t be anymore soon. First prepare the semi-dried apples. Peel, core, and cut apples into 8mm cubes. Sprinkle lemon juice on apples immediately to prevent them from yellowing. Stir the sugar in. Preheat oven to 90C and spread the apples evenly on a baking tray. Place the baking tray into the oven and bake-dry them for about an hour, depending on variety of apples used. The apple cubes should look slightly dry. Allow them to rest to room temperature. To make the macaron shells, repeat the steps in our Pear and Elderflower recipe. 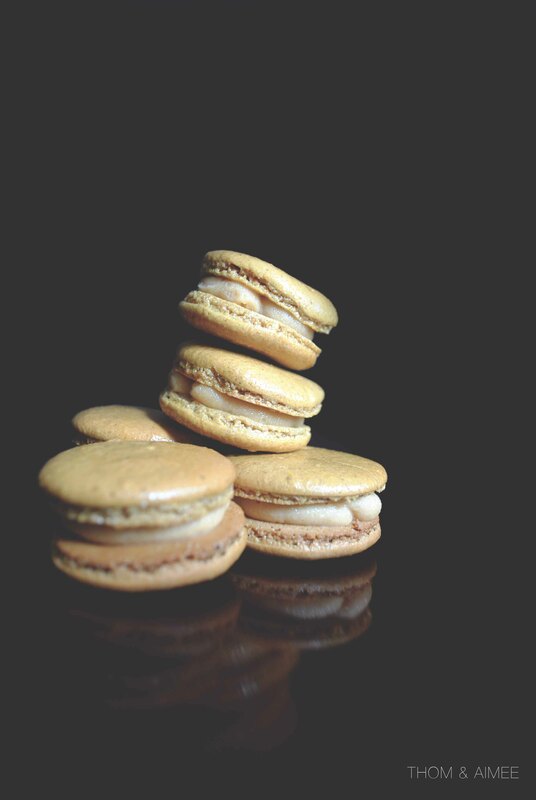 The extra step for this Salted Butter Caramel and Apple macaron, is to stir the egg yellow colouring and Trablit extract into the first portion of egg whites. To make the salted-butter caramel cream, bring the crème fraiche to the boil. Do not take your eyes off the crème fraiche as it will turn into an overflowing mess when it reaches boiling point. Pour 50g sugar into a large saucepan and allow sugar to melt before adding another 50g. Repeat this step one more time. Allow to caramelize until it turns dark amber. Take the pan off the heat immediately and add the 33g lightly salted butter. Stand back as the mixture will bubble and spit. Stir with a spatula and pour the crème fraiche a little at a time while stirring continually. Return the pan to a low heat. Heat the caramel until it reaches 108C. Then pour it into a wide dish and press cling film over the surface. Place dish into refrigerator until cold. In an electric mixer, whisk butter for 8 minutes to make it light and frothy. Whisk the cooled caramel cream in. Spoon the salted butter caramel cream immediately into a piping bag with a plain nozzle. Pipe the cream onto half the shells then gently press several semi-dried apple cubes into the centre, before topping them with the remaining shells. Store the macarons in the refrigerator for 24 hours before serving. I’m baking these today but I’ve been hard-pressed to find quality trablit coffee extract here in Singapore! Planning to just use dissolved coffee powder but I’d rather not! Did you get your coffee extract here? By the way, I love the serene feel of your blog, it’s reassuring and elegant. Glad I found it! Hi Ruru, thank you for your wonderful comment! We’re glad that you enjoy our blog, thank you! Just curious, do you use macaron flour from here or do you grind your own flour? Nice to know your macarons turned out great! I don’t think we have macaron flour here; we use grounded almond and icing sugar and sift them together.